Learn how to make yogurt at home with this simple homemade yogurt recipe! I thought that yogurt making would be much more difficult than it actually is…but it really is pretty simple and straightforward. This yogurt recipe is easy peasy and so delicious you’ll actually crave it over the store bought kind. All you need is the list of ingredients and supplies below, some time and a little patience to make your own yogurt at home. Remember, however much milk you use is the same amount of yogurt this recipe will produce so plan ahead with clean containers accordingly! Create a double broiler by filling your large pot with water so that the smaller pot sits in it. The water should reach no more than 1/2 way up the smaller pot (or level with the milk in the small pot). Note: Your smaller pot is going to want to float so hold it down firmly while judging how much water you will need in the large pot. You can always dump more out later, but less water means less time to boil! Wait for water in large pot to boil, then pour milk in smaller pot. Again your smaller pot will want to float while empty so be very careful when pouring the milk in. Also, check the water level again once all the milk is in the small pot to make sure it doesn’t rise above halfway up the small pot. Place the thermometer in the small pot and wait until it reaches 180-185 degrees. The milk should start to froth at this temperature. Stir frequently. Hold it at this temperature for 30 minutes so the consistency will get nice and thick. While your milk is heating up fill your sink up about 1/4 of the way with cold water. After the milk been heated to 185 degrees for 30 minutes, move it to its ice water bath. The level of water on the side of the pot should be even with the level of milk in the pot. The yogurt cultures begin to consume the lactose in the milk at 110 degrees, so let the milk cool to this temperature while stirring occasionally. Pour your yogurt starter into your 110 degree cooled milk and stir in thoroughly. Cover pot with lid. Set heating pad on medium and place on a cutting board. Put the pot on top of the warmed heating pad and cover additionally with a dish towel. Wait seven hours. Yes, seven. Hey, all good things come with time…right? It’s worth it, I promise. After your seven hours waiting time is up, it’s time to uncover your homemade yogurt and make sure that it has curdled properly. You may even see a greenish liquid. That’s ok! It’s a good thing. Stir vigorously to ensure the curds mix in well with the milk to make your yogurt. Pour yogurt into clean containers with properly fitted lids. Screw or snap lids on tightly to prevent contamination. Or just enjoy it right then and there! That’s all, fellow homesteaders! Did you enjoy my homemade yogurt recipe? Let us know in the comments section below what you thought of our homemade yogurt. 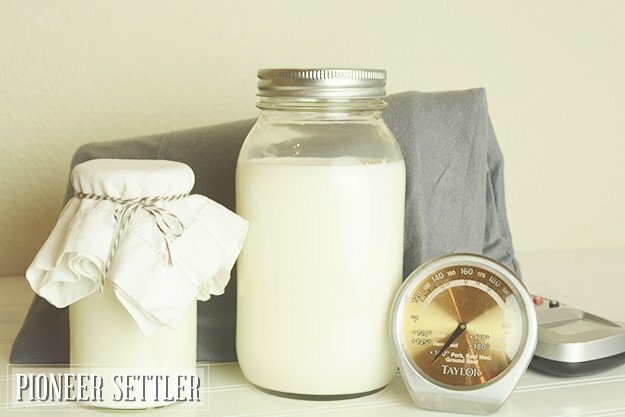 Do you have a favorite yogurt recipe that’s a staple on your homestead? Share it with us and we’ll give it a shot. We love doing DIY homesteading projects and becoming more self-reliant by learning more about how everything works around the homestead. That’s why Homesteading was created. We want all folks looking to lead a self-sufficient life, either on a homestead or in an urban environment, to come together and learn from each other! Of course, we welcome your help in creating a community of homesteaders. Come and share your homesteading tips and ideas, recipes and expect the best advice on self-reliance and homesteading trials from our team of long-time homesteaders, self-reliant wilderness, and preparedness experts. Want to write for Homesteading? Shoot us an e mail and make sure to stay in touch on Facebook, Twitter, and Pinterest!